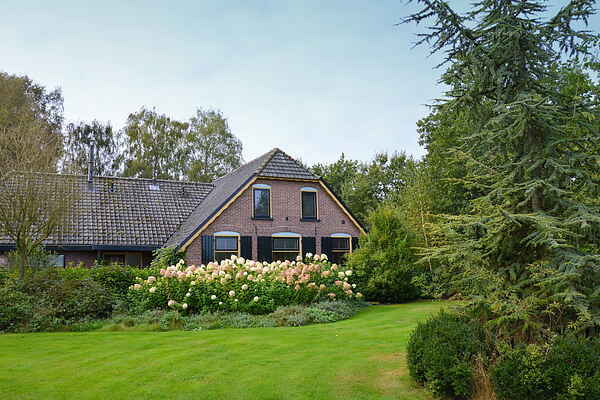 Beautifully situated house in the Veluwe, a short walk from the center of Wekerom. De farm is divided into the farm and a guesthouse. The farm features a large, luxury kitchen with dining for 10 people. In the cozy living room you can be delicious with the entire group. The wooden beams and tasteful decor make this farm an attractive place to spend a holiday with family or friends. In the guest house are two bedrooms with private bathrooms, the third bathroom is located in the farmhouse. During your stay you will receive one entrance ticket per person to a sauna complex in Lunteren. By bike, on foot; discovering the beautiful area of ​​the Veluwe with beautiful forests, vast moors and gently flowing streams is a real must. National Park De Hoge Veluwe and the Kröller Müller Museum, which has the second largest Van Gogh collection, is only 10 minutes driving. Closeby the village of Wekerom you can find a unique sand drift area. Right in the forest a large open area where sand has free play. Overall an excellent location for lovers of nature, culture and space.